We chat to Danielle about Robot Dancing! Out on Blu-ray™ and DVD from today, Real Steel stars Hugh Jackman as irresponsible ex-boxer Charlie Kenton who has been lost since boxing went high-tech and 2000-pound, 8-foot-tall steel robots have taken over the ring. But when he gets reunited with his son Max and the pair discover an old, very special robot called Atom, Charlie gets one last shot at making a triumphant comeback! Real Steel is out on Blu-ray™ and DVD now – click here to order your copy! One of the highlights of the film has to be when the robot Atom dances before each fight! So this week we spent the day with Street Dance UK to learn how to dance like a robot! Safe to say our presenters weren’t very good, especially compared to 11-year-old Danielle who was there learning some dancing moves too! So we thought we’d quickly have a chat with her to find out what she thought of the day, and see if she could give us any tips! Remember, right now our presenters are performing a robot dance off to win your vote! All you need to do is vote for you favourite dance and in return you’ll be entered into a draw to win Real Steel on Blu-ray™ and a PS3 console! 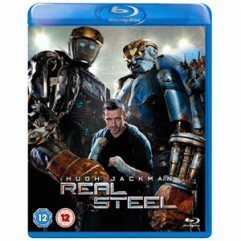 Plus there’s 3 more copies of Real Steel on DVD for runners up! Click here to watch the videos and vote!